A great treat for a class party or your children. Add a little pizazz to fruit cocktail. A perfect first recipe your toddler can help make. Drain juice from fruit cocktail cans. Pour into bowl and add marshmallows. A clear bowl makes it easy for children to view activity. Have the recipe written out and point out ingredients and steps as you go. Line up ingredients on table to help reinforce sequencing skills. Have children guess if this will be a salty or sweet treat. Easy activity to make a book to go along with the recipe. 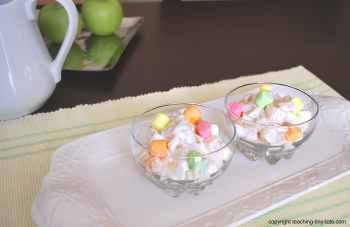 Make a single portion with a small fruit cup and add a dozen mini marshmallows and a couple teaspoons of sour cream. Add a few colored mini marshmallows on top.